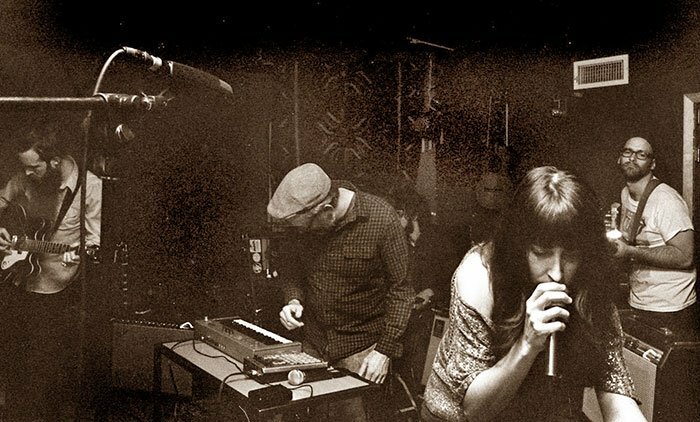 The Lilypad in Cambridge’s Inman Square bills itself as having “The Most Original Live Music in the World. Every night.” While that slogan could be interpreted either quantitatively or qualitatively, the concert Sunday night by The Raha Duo definitely was a quality offering: a sensitively chosen range of works including two challenging pieces from the new millennium, two from the last century, and one from the middle of the 19th century. Pianist Elaine Rombola Aveni dove right in with Ruth Crawford Seeger’s Piano Study in Mixed Accents (1932). This iconic work of highly compressed modernism is a daring bebop prelude—it sounds like it should continue on to be spun out into a larger big-breathed jazzy work. But as its own little taut microcosm, it has to stand alone, a testament to that visionary composer’s influence and prescience. It flies by in jagged lines and exposed octaves. While not note perfect, Aveni’s performance captured the biting, breathless intensity. The first movement “Nearer Waters Roll,” began in stark, ponderous parallelisms (fifths) that gradually gained in flexibility, exposing a series of sections, each exploring a different texture or motive. The instruments gradually accelerated with the viola in expansive slurred triplets. After a hushed passage with viola harmonics in unison with the piano, the movement ended with a piano outburst. The next movement began with alternating pizzicato and bowed passages in the viola, over pointillist chords in the piano. 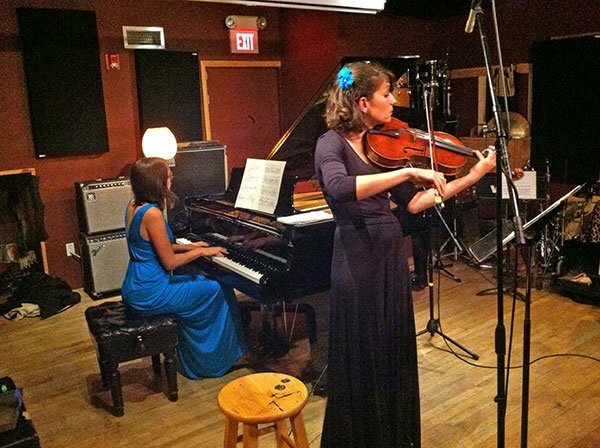 After some expansive legato lines in the viola, the pizzicatos return, frenetic over the piano’s unmoored blotches. The emotional effect here was one of poignant desperation. The third movement was (as McLoskey explains) a Chaconne; or, a ground (as I observed, and not having read the program note). It begins with dark, ominous, disconnected pitches in the piano; the viola enters, and with a stark melody reveals the piano notes as a foundation. The piano gradually ascends, refracting and fragmenting the notes of the ground, while the viola melody takes on soaring leaps. The ponderousness becomes more and more energized, with the piano taking on tone clusters and the viola now bounding in gigantic double stops. It built surely and inexorably, relentlessly, exhaustingly. Until finally it dissolved in a tinkle. This piece was devastating in its power and I was truly impressed by the performance. Was it a prayer, as McLoskey suggests? If so, it was a very dark one. Caroline Shaw, herself a violinist as well as a singer and composer (and winner of the 2013 Pulitzer Prize), displayed idiomatic string writing the next work, her In manus tuus of 2009. The title, as in McLoskey’s work, indicates a sacred theme; in this instance a motet from the 16th century by Thomas Tallis. Shaw suggests her work is a reflection on a frozen moment of listening to that motet — another contemplative work. For viola alone, it included a range of extended techniques. Among them was what I call the “scratchy scratchy” effect; I guess composers feel they need to “push the envelope” by requesting a sound that is close to fingernails-on-chalkboard. Apart from that I enjoyed the piece, and thought it was idiomatically written. In the midst of a series of whirling repeated arpeggios, Ames also had to sing a sustained chord tone, which she did with great lucidity. The result was quite haunting. In a few places we could hear the polyphony of the motet, played in three or four note arpeggiated chords. Then the motet chords were played in strummed pizzicato, with accents thrown in to upset the natural phrasing. Overall, the effect was kaleidoscopic— we heard recognizable fragments in unexpected contexts. Then Aveni played a piano solo, a movement of Carl Ruggles’s Evocations (#2, dedicated to John Kirkpatrick). Written around the same time as the Crawford Seeger, it recalled that work in focusing on an angular melody, but more gently shaped and gradually filled out with chordal texture and repetitive elements that shift and overlap. It was indeed evocative. After all that modernity I was afraid that Robert Schumann’s Märchenbilder (Fairy Tale Scenes) would seem cloyingly sweet, but instead it was a refreshing palate cleanser. Here the Duo got to shine with warm, luscious tone and exchanges of melody. The second movement (Lebhaft) was memorable with the vigorous 6/8 and chordal of the knight on horseback. And the final movement was a gentle lullaby (“sweet dreams,” as Ames described), with rich harmonies in viola double-stops, and then with the viola delicately accompanying the piano’s resonant singing. The performers thanked their parents, and Ames noted that it was Grandparents Day, and that the musicians were very grateful to these grandparents for taking on child care, so that the Duo (both mothers) could prepare for the concert. Ames and Aveni are both poised and accomplished musicians, and balance between the instruments was never an issue. As a music venue, I had wondered how the Lilypad could compete with its neighbor Ryles, the Jazz institution. But the Lilypad offers something very different, simple and intimate. It is much like a cozy living room that could comfortably seat 45 in an assortment of chairs, a sofa, and backless benches. Compared to a traditional concert hall, it offered both pros and cons. It was great to be able to drink a Magic Hat Pumpkin Ale during the concert, but then I did have to worry about spilling my drink. Ambient noise from passersby, and from the loitering smokers from the bar next door, and then, the next band arriving, proved to be the biggest downside of the venue. This aleatoric element occasionally had a certain charm, but in quiet moments of focused intensity it was an annoyance. But wherever they next perform, I will look forward to hearing the Raha Duo. The Lilypad frequently presents classical ensembles. I wanted to commend the Third-Sunday-of-the-Month concerts at Lily Pad, arranged by Nick Dinnerstein. I’ve attended many of them. Each is devoted to a single 20th or 21st Century composer. Among last season’s delights were recitals of the works of Britten, Ligeti, Bartok, Shostakovitch, Schnittke, and Part (supply diaeresis, please!). The performances, by young professionals, are excellent and the atmosphere (YOUNG people throng here!) is delightful. I’m 80, and it’s inspiring to see so many people in their 20’s and 30’s enjoying serious music. This Sunday the composer is Stravinsky, and among the works to be played is the four-hand arrangement of Rite of Spring.